Use stick pretzels and insert a tiny marshmallow onto each end. Cover with melted white chocolate or white bark. Let rest on cookie tin covered with wax paper. Very neat snack! This entry was posted in Crafts ~ DIY ~ Projects, ~Edible, ~Halloween and tagged almond, bark, bone. 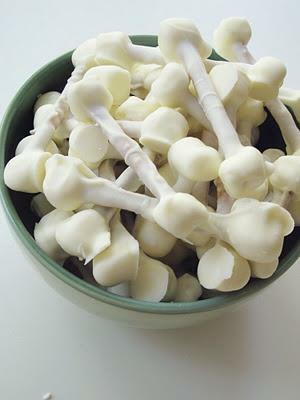 bones, chocolate, mashmallow, Pretzel, snack, stick, treat, white, ~Halloween. Bookmark the permalink.